This symbol, which most people have seen in a variety of contexts, pares things down to one clear and elegant image. As far as symbols go, it just doesn’t get more fundamental than Yin-Yang. Like Einstein’s famous equation, E = mc², the Yin-Yang symbol describes something very elemental and incredibly complex. What Yin-Yang points to and represents is so vast it encompasses everything in the Universe. Yin and Yang, like TCM’s Five Element theory, are integral to the Chinese culture and have been so for thousands of years. Unbelievably, references to Yin and Yang date back as far as 700 B.C.E. to the I Ching (The Book of Changes, a text Universal in its understanding and representation of the dynamic balance of opposites and the processes of unfolding events and change). Yin and Yang are distinctively Chinese in terms of perception of profound fundamental principles and as an expression of a unique way of viewing the world and the greater universe. They are literally and figuratively a world apart from Western thinking. Everything contains Yin and Yang. They are two opposite yet complementary energies. What does this really mean? Although they are totally different—opposite—in their individual qualities and nature, they are interdependent. Yin and Yang cannot exist without the other; they are never separate. For example, night and day form a Yin-Yang pair. (Night is Yin and day is Yang.) Night looks and is very different than day, yet it is impossible to have one without the other. Both create a totality, a complete whole. This inseparable and interpenetrating relationship is reflected in the form of the Yin-Yang symbol. The small dots within each of the two energies (represented by black and white) symbolize that there is always some Yin (black) within Yang (white) and vice versa. No matter where you bisect the diameter of the whole circle, each half will always contain some Yin and some Yang. Nothing is absolute with Yin and Yang. The designation of something as Yin or Yang is always relative to some other thing. For example, day is Yang, yet within every day is a Yang part—the early morning, and a Yin part—late day, as it begins to turn to night, which is Yin. 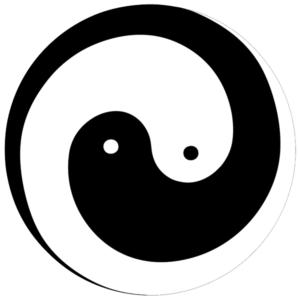 In the Chinese Yin-Yang model, Yin (the black) contains a seed of Yang (in the form of a white dot). There is Yin, but interestingly, Yin is also Yang because it contains some Yang. The truth is Yin can transform into Yang under certain conditions. It can do this because Yang is present in Yin. So there is balance, but the relationship goes beyond balance to one of harmony. When two things are balanced, they are equal but still separate. In a relationship of harmony, the two energies blend into one seamless whole, as perfectly embodied by the swirling Yin-Yang symbol. This means there’s a dynamic flow happening that automatically and continuously balances and rebalances these energies. In the natural world this phenomenon is seen in the changing of the seasons: the cold of winter yields to the warmth of spring and summer heat, and then gradually turns cool in fall to become winter once again. You can also see this perpetual balancing at work in a shorter time frame when a thunderstorm clears the air of an unusually hot and humid summer day. In terms of your personal health, if you think of how you feel when you feel really well, you might realize you don’t think of wellness at all! Everything in your life just flows and moves seamlessly—in harmony. Your body, mind, emotions, and spirit can adjust and readjust to the circumstances in your life. This is precisely the state TCM seeks to create; that of balance. You might be wondering how Yin and Yang apply to you and your life, and to any health issues you might have. Theories are interesting, but unless they have some meaning to your own experience, what’s the point? First, the theory of Yin-Yang tells us that at the macro level—the largest scale imaginable—all things are always balancing and rebalancing into a state of perfect harmony. Yes, there is ceaseless change, yet this movement and flux, at its deepest level, is creating harmony, is perfect harmony. Yin and Yang are the two energies that embody Universal law, which ensures that all things remain in harmony. It’s often difficult to actually see this harmony on a smaller scale, in the world around us, for instance. It isn’t always apparent in the world humans have created and especially in our busy, frequently complicated modern lives. But think about it: if you really understand and believe in Yin and Yang, harmony is the Universal architectural framework that underlies and impacts this reality. So in essence, harmony is the only ground we walk on and is the very air we breathe. How can you apply this awareness to your life? A great part of TCM’s healing approach is to help you step back from your life and look at where your life might actually be creating health issues for you. For most people, this is a process that happens over time. For some, it comes in a moment of great insight. From the TCM perspective, what is the point of continually treating symptoms that are caused by emotions, patterns of thought, belief systems, or a lifestyle that is out of balance? Truly, isn’t it better to understand and work to change the root cause (or causes) of the problem? The entire Universal pattern is one of establishing balance and harmony. This perspective can help you more peacefully view the world and your role in it. Most people have heard the saying, “As above, so below.” If Universal law is all about creating and maintaining harmony, wouldn’t the limitless power of that energy force support in some way your own efforts to create harmony in your own body and being? As a deep and authentic healing system, TCM understands and applies Yin and Yang to help you harmonize your body, mind, emotions, and spirit, and then harmonize your individual energy with nature. In a typically poetic way, the Chinese characters for Yin and Yang reveal something about their respective qualities. For example, the character for Yin can represent the shady side of a hill, while the one for Yang can indicate the sunny side of a hill.